ITU Telecom World 2009 took place at Geneva’s Palexpo, just down the road from CERN, from 5 to 9 October. This high-profile, internationally-renowned show organised by the ITU, the UN agency responsible for telecommunications, attracts visitors from both the public and private sectors sharing a common interest in information technologies and communication. 18,000 people passed through its gates in 2009. Visitors flocked to CERN’s stand, which proved to be one of the show’s most popular, keen to find out about the LHC restart and the communication technologies mobilised for this extraordinary endeavour. The CERN stand was located in the section supported by the Cantons of Vaud and Geneva called "Lake Geneva Region", covering over 700 m2 on two levels and promoting the region’s excellence by highlighting thirty innovative companies and organisations based there. A console similar to the one in the CERN Control Centre was presented. Equipped with seven screens and a multipoint video conferencing unit run from CERN, the console was directly connected to the CERN Intranet via an extension of the optical fibre supplied by the Geneva municipal services (SIG), providing a 10 gigabyte per second connection speed. The computing grid’s new visual display tool, developed by a team of engineers from the IT Department’s "Grid Support" Group, captured the public’s imagination. By coupling the Google Earth interface to the "Dashboard" (system overseeing the various computing activities of the LHC experiments), this tool provides a visualisation of the data flow and the jobs submitted via the Grid over the past ten minutes. Members of the various experiments, accelerator personnel and people from the IT Department took turns on the stand to answer the many questions raised by the videos, diagrams and monitoring interfaces presented. 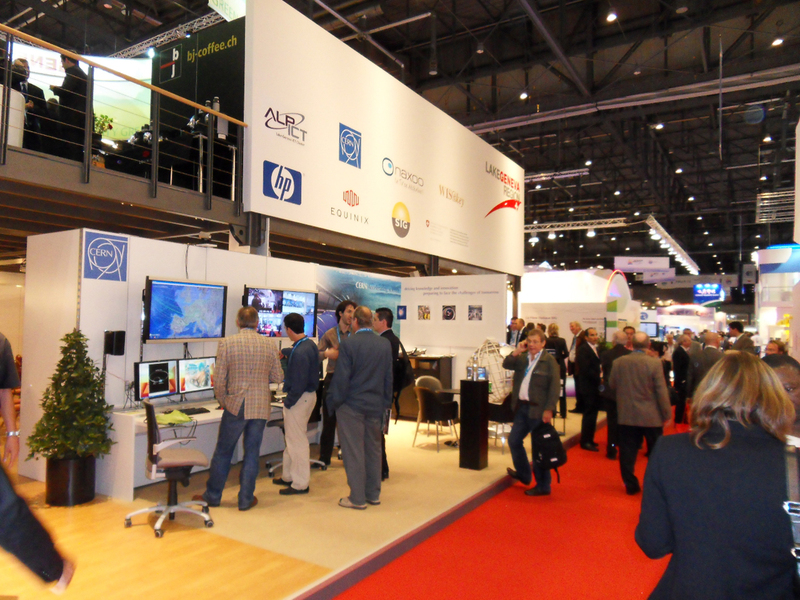 CERN’s ‘Multipoint Control Unit’ video conferencing system and two terminals provided by Tandberg allowed ten partner centres spread accross the world to take part and interact in real time with the visitors, exemplifying the international nature of the collaboration on the LHC. Over the course of the week, three lectures were held in the "Lake Geneva Region" auditorium, presenting CERN in more detail, along with the LHC and the collaborative tools developed at CERN, such as Indico. The lectures were streamed live on a CERN webcast and the recordings are now available on the website of CERN’s partner for the event, Swiss start-up firm Klewel (http://www.klewel.ch).